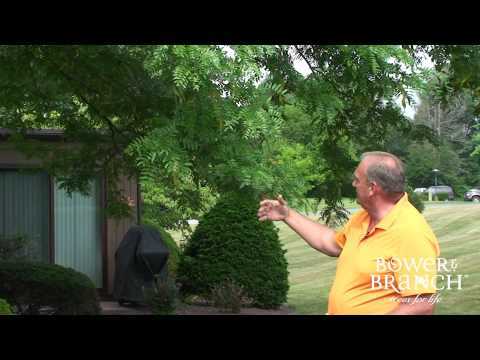 Shademaster® Honeylocust is a fast-growing, bulletproof shade tree for any sunny spot in your yard that could use some relief from the hot summer sun. Because it has tiny leaves (leaflets), it doesn’t cast a dark, gloomy shade like some large-leaved trees, but a nice dappled shade that’s perfect for reading a book or having a meal al fresco. The small leaflets also make fall cleanup a breeze, as many of them simply blow away, while the rest decompose quickly into mulch, leaving you with only the leaf stems to gather up—or not. This native tree has no thorns and produces hardly any pods like wild Honeylocusts do. The Princeton Nursery was founded in Kingston New Jersey by William Flemer Sr. in 1913. After years of searching for a new site to grow his business, Flemer chose Kingston for its nutrient rich soil and location which was halfway between New York and Philadelphia. Flemer continued to buy land and property to provide housing for his many employees. At its peak the nursery grew to 1200 acres and was the largest commercial nursery in the United States. Through the Great Depression the nursery survived by growing farm crops and using German prisoners of war for labor. William Flemer III, specialized in breeding and introduced many new varieties of shade and ornamental trees. The nursery was granted dozens of patents including Shademaster Honeylocust. The nursery closed in 2010 but more than 240 acres of the nursery have been preserved along with 25 historic structures. Here you can still find many of the beautiful trees introduced and planted by the Flemer family. Change your idea of Honeylocusts forever! Not your typical Honeylocust - Shademaster is thornless AND seedless, making it a top-notch choice for a street tree. This easy to care for "guru of shade" supplies ample shade for you and yet allows enough sunlight to pass through for grass to grow beneath. This fast-growing, drought tolerant tree is decorated with fine-textured dark green foliage, which changes to yellow in fall. Honeylocusts are the street trees of choice! You’ll see them along city streets, even in planting beds scattered throughout the parking lot at malls and grocery stores. One reason they make great street trees is because they can tolerate salt, so they can stand up to the salt truck spreading salt all over the road in wintertime. They are fast growers that prefer full sun and will tolerate a range of soil conditions, however, they don’t do well in consistently wet soils. Honeylocusts occasionally sprout suckers, when suckers appear be sure to prune them off. Not only are they unsightly, they also steal valuable energy from the rest of the tree. It is also beneficial to fertilize your Honeylocust for the first few years that it graces your landscape. About once a year, in the fall, give your tree a dose of medium rate fertilizer; this gives your tree the essential nutrients it needs to provide healthy new growth for the following spring season. Honeylocusts are susceptible to some pests: leafhopper and fall webworm, for example. Consult with your local Garden Center professional to find out how to treat these pests if you have a severe problem. If you only have a small pest problem, chances are if you leave it alone, your tree will grow back fine the next growing season. 8-10' tall. Well developed head and branching structure. Limbed up to 5'. Strong caliper over 1 1/2". Will be providing shade quickly. Grown in our #15 tree container.